On Wednesday, Museum staff joined the hunt for Fort Morris in Shippensburg, PA.
Excavations have previously uncovered ceramics, musket balls and gun parts and flints dating to the Mid-Eighteenth Century. The first coin was found this week. It is copper half-penny in relatively poor condition. However, the left facing figure with a laurel wreath crown (King George II) on one side of the coin and the outline of Lady Columbia on the other side, indicate that it is probably a King George II half-penny. These coins were produced from 1727-1763, three years after the King’s death, yet the last printed date on coins themselves was frozen at 1754. Fort Morris was one of many military posts commissioned during the French and Indian War to protect the British colonial western frontier. Historical documents tell us that Col. James Byrd directed the fort’s construction in 1755 and that it was maintained as a military post through 1764. It is possible that early settlers in the Shippensburg area squatted in the Fort’s interior buildings after this time. But by the late 1800s, it is believed that all documented structural remnants of the original Fort—its fortifications consisting of a stockade wall with four corner bastions, its associated buildings, and water well—had been abandoned and removed. The land was farmed and eventually reclaimed as a residential plot by the growing borough. Subsequently, the exact location of the Fort became obscured and confused in local lore and history. Stephen Warfel, former Senior Curator of The State Museum is conducting his second field season on the most likely of three locations speculated to be the original site of Fort Morris. Last year, Warfel’s crew of local volunteers and Shippensburg University students tested this location with the permission and invaluable assistance of the landowner. They recovered numerous Fort Period artifacts and evidence of sub-surface features that could be portions of fortification or building trenches associated with the Fort. My time at the State Museum of Pennsylvania’s Section of Archaeology has been extremely rewarding. However, I see now that my career aspiration of being an archaeologist is more involved than I had imagined. It is not all the glories of sitting in the desert with huge piles of suddenly discovered long-lost gold at my feet. I often find myself at the mercy of a computer and Microsoft Access. This holds an archaeologist’s true treasures. A trowel is important, but artifacts are not if you don’t know what they are or where they came from. Data are the keys to organization which is essential to archaeology. Computers, along with various other facets of technology, have helped to advance archaeology and make it sustainable. Little did I know what adventures awaited me when I signed up through my Cooperation Education at Central Dauphin High School. My opportunities were endless-databases for artifacts, inventorying Society for Pennsylvania Archaeology journals, copying, and even a hands-on excavation at Fort Hunter- an archaeological gem just minutes from my house. This experience, digging everyday and sifting through buckets of dirt for that special artifact, is my favorite memory. It combined the outdoors, public outreach, and real scientific practices into a one month-long celebration of archaeology. My days were definitely not always the same. Some days were a relaxing session of labeling artifacts in the lab or fixing light bulbs in the museum galleries. Even if I don’t know it, I am always learning. That is the key to a good teacher. I want to sincerely thank everyone at the State Museum of Pennsylvania Archaeology Section, Mrs. Janet Johnson, Dr. Kurt Carr, Liz Wagner, Dave Burke, Andrea Johnson, and Jim Herbstritt. I appreciate your time and decision to invest in my future! Wig curlers, also know as bilboquet or roulettes in the eighteenth century are recovered in some abundance from urban sites dating between c. 1700 and 1780. These wig curlers were excavated from 712 Arch Street Philadelphia as part of the Metropolitan Detention Center Project (36Ph91) by Louis Berger and Associates. 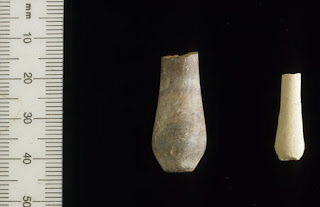 They were dumbbell-shaped and made of Kaolin like clay. Interestingly, newspaper was sometimes wrapped around the curler along with the hair and in some cases actual news print is still evident on the clay. Great care should be taken in examining such pieces prior to washing to protect any existing print. Rock and roll music may have lasted a long time, but rock art has been around thousands of years. Rock art is what archaeologists call “petroglyphs.” Petroglyphs are images and symbolic designs carved by early peoples into rock surfaces. Join us with an RSVP to attend this FREE presentation hosted by the Pennsylvania State Bookstore. FREE POSTER to all attendees! Dr. Kurt Carr, Senior Curator from the State Museum of Pennsylvania, with the Pennsylvania Historical and Museum Commission, assisted Ms. Evans with a simulated Archaeology excavation. 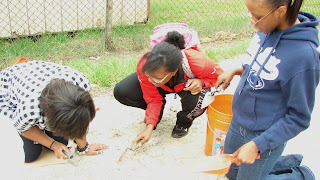 The excavation is part of a lesson on Forensic Anthropology in Ms. Evans's three Forensic Science classes at Susquehanna Township High School, Harrisburg, Pennsylvania. Eighty high school 11th and 12th grade students worked at the death scene with Dr. Carr. The 100 square meter excavation site is an open, dirt covered, area outside the high school building. The students uncovered and mapped deer skeletal remains at the site. The skeletal remains were placed in the site with related “artifacts”, that when uncovered and mapped, will “tell the story” of what happened in the deaths of two deer. 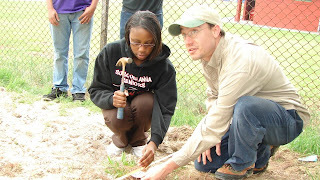 Under the direction of Dr. Carr, the Forensics students used archaeological techniques, methods and theory in their investigation into the deaths of the two deer. The deer skeletal remains are being “recycled” from the classes’ labs on Forensic Entomology at the high school and were donated by the Pennsylvania Game Commission. Forensic Science students set up a measurement grid for the excavation. They then walked across the surface of the site mapping the location of bones and related artifacts (potential evidence). The goal of today's activities was to decide the best locations to excavate. Based on this surface collection strategy, student teams picked the square meter of the excavation in which they wanted to search for more evidence. They returned on Friday with trowel in hand to uncover the bones buried in the ground. On the second day of the investigation, the Forensics Science students worked in teams to excavate a single unit at the site. Under the supervision of State Museum archaeologists, the investigators mapped, bagged and labeled the artifacts found on the surface of their unit. Units are 1 square meter areas on the 100 square meter site. The units have been named using a alphanumeric system. Once the surface artifacts were removed, the investigators used trowels, brushes and dust pans to remove the soil.